One-day Vetements Pop-Up Event in cooperation with DHL and the Chinese fashion retailer Joyce at Kai Tak Cruise Terminal, Kowloon Bay. On November 17, 2017, the fashion brand Vetements publicly announced the secret location of their one-day Pop-Up event in China the following day. 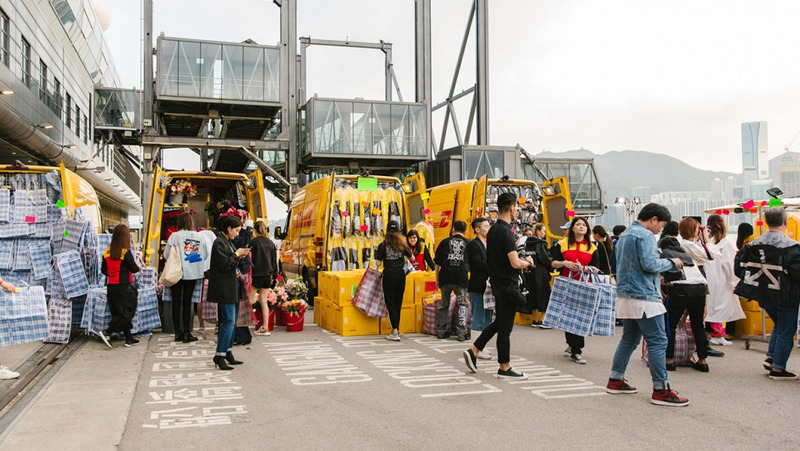 The Kai Tak Cruise Terminal, a luxury cruise ship terminal at the dock of the former Kai Tak Airport runway, became Hong Kong's most sought-after venue, from 4:00 p.m. and 11:00 p.m.. Since DHL functioned as the official partner for this unique Pop-Up Event, the limited Vetement capsule collection was sold to the public directly through DHL trucks that turned into market stalls. 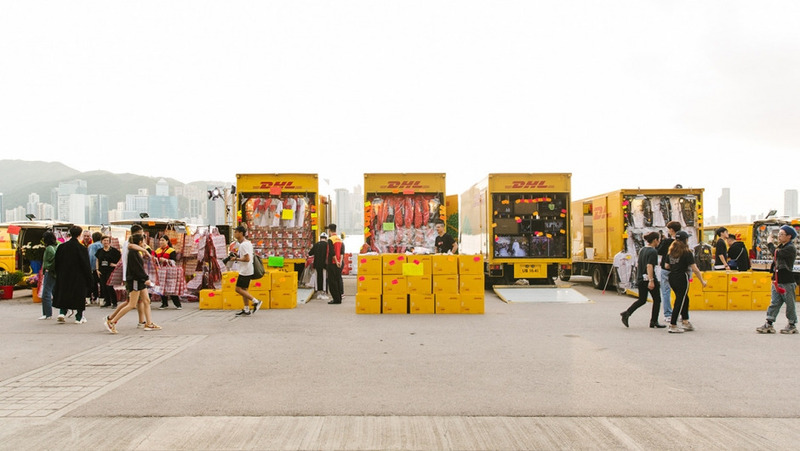 The unusual Pop-Up marketplace formed by a fleet of DHL trucks was inspired by the famous Hong Kong Ladies' Market on Tung Choi Street. Available to public purchase were the latest Vetements' collaborative fashion items from DHL, Tommy Hilfiger, Umbro and Reebok. The extensive range of globally exclusive Vetements ready-to-wear included limited sneakers, raincoats, jackets, T-shirts, socks and tongue-in-cheek Vetements souvenirs from Switzerland, the country where Vetements is currently located. Over the past years Vetements' parodic streetwear aesthetic conquered couture at Balenciaga while vetementized fashion collaborations are hyped by fashionistas around the world, particularly in unexpected territories such as China. Bringing the Vetements flash Pop up sale to China eventually caused a sensation amongst Chinese fashion fans and went viral on social media. The crowds of visitors and fans at the flash Pop-Up event emphasize the popularity of subversive streetstyle, fashion collaborations and the success of unusual Pop-Up sales today. According to Business of Fashion, the daily resource for fashion creatives, executives and entrepreneurs, it's not surprising that Vetements is in fourth place behind Gucci, Yeezy, Balenciaga on the lyst index Q2 2017, which ranks the top designers and products of the moment through tracking 4.5 million data points per hour from over 65 million annual consumers, 4 million products and 12,000 brands. 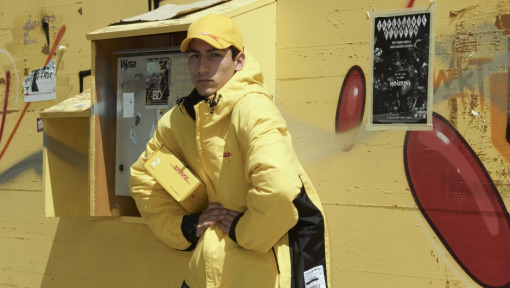 The Pop-Up cooperation between DHL, the fashion brand Vetements and the Chinese fashion retailer Joyce represents a fresh take on common shopping experiences, fashion promotion and business cooperation. 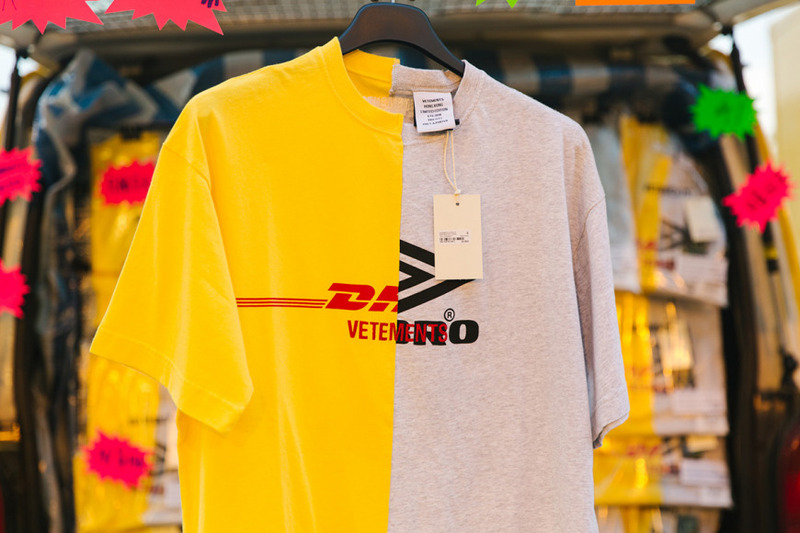 Following a meeting between Vetements' Demna Gvasalia and Ken Allen, CEO of DHL Express, which Vetements first collaborated with on the legendary DHL T-shirt - the idea for a limited DHL x Vetement capsule collection was born. Joyce Boutique, Hong Kong's mecca of independent fashion brands, stocking Vetements collections since 2014, initiated a joint way of hosting a Pop-Up sale in Hong Kong. 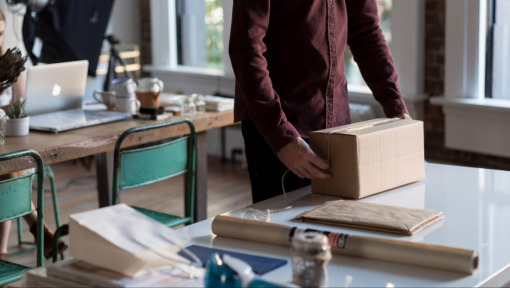 The great success of the Pop-Up event best exemplifies the progressive entrepreneurial acumen of the three leading companies. The limited DHL x Vetements capsule collection is currently exclusively available at Joyce.